Weldcote Metals, a division of Zika Group, recently announced the availability of a comprehensive line of metalworking abrasives, many of which will be made in the U.S. at Weldcote's new, state-of-the-art, production facility in Niles, Ill. The entire line includes more than 900 new SKUs. Leading the new offering is a line of flap discs, all made in the U.S. With multiple bonding and backing systems, backing plates and design shapes, the discs will handle a wide variety of applications. The flap disc materials, formulated for a wide variety of metals, include ceramic (C-Prime and C-Prime Plus), zirconia (Z-Prime and Z-Solid), aluminum oxide (A-Prime) and aluminum (ALU-Prime). Rounding out the new offering is U.S.-made quick change discs, as well as Korner flap discs, resin fiber discs and flap wheels. High-quality, resin-bonded abrasives are now available in the U.S. due to an exclusive relationship with a renowned Italian abrasives manufacturer (PRIME brand), as well as a partnership with a well-known Chinese supplier (SOLID brand). 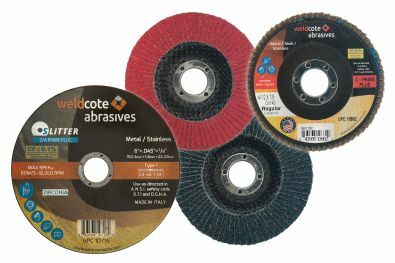 Finally, the Weldcote abrasive program also covers a full line of cutting wheels (branded as SLITTER). "Our new product team has over 90 years of experience in the abrasives industry," said Joe O'Mera, CEO of Weldcote. "It was only natural for us to take that experience and use it to create an abrasive line that increased performance and functionality for users. The fact that we were able to make the majority of the line right here in the U.S. is a huge bonus."